Selin Kiazim, former head chef at Kopapa, is hosting a one night summer supper at Caravan in Exmouth Market. It's £40 per head (pay £20 to book at the link below) and takes place on Sunday 28th. All dishes are for sharing, so it should be a fun evening! "Selin Kiazim is back and very pleased to be collaberating with the brilliant team at Caravan Exmouth to bring you the next Trinkets experience. Expect to enjoy a Summer feast, great cocktails and chilled out vibe, perfect for a Sunday evening! Selin will also be releasing details of her up and coming residency at an exciting new location in Hackney! 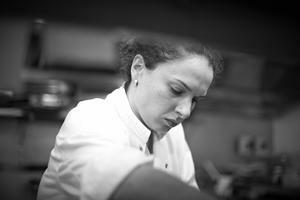 Until recently, Selin was head chef at award winning Kopapa restaurant in central London. She takes inspiration from her Turkish Cypriot heritage and is focussed around communal eating and encouraging conversations about food by sharing dishes between diners. She is inspired by flavours from travels, from friends and from fellow chefs. Selin’s food has no boundaries or easy categorisation, she is constantly experimenting and innovating, combining classic flavours with new ingredients from around the world.